Mighty Bucky Extreme, Mighty Bucky, Mighty Broncy, & Lil' Bit Bucky are training simulators designed by P.R.C.A. 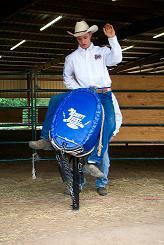 bull rider Terry Holland, and used by more top pros than any other training unit. These training devices are for beginners as well as advanced competitors. In a sport that is very dangerous and where practice can be risky, the Mighty Bucky Line offers rough stock riders a way to work on and improve their skills without the risk of injury. In the field aviation, pilots spend hours in simulators to prepare for a career where even the slightest error can be critical. Great hitters in baseball have spent equally as much time in front of a pitching machine in order to fine-tune their hitting skills. The Mighty Bucky Line, along with your imagination, creates your virtual reality in the comfort of your back yard. If the Mighty Bucky Line can help you win one rodeo, or prevent one injury, then it's worth the investment. The Mighty Bucky Line is tough, durable, adjustable, easily set up, and affordable! You will no longer have to wait for others to help you practice because the Mighty Bucky Line bucks easily without the assistance of others. When you realize that only "Perfect Practice Makes Perfect" you're ready for the best Perfect Practice Unit available. When your R.O.I. (return on investment) is critical and you have come to realize that Rodeo is a business and not something you do on the weekend, you're ready for the training unit of champions. Mighty Bucky Line - The difference between playing rodeo or living rodeo.